Moving away from the usual box shaped geometric sauna design the Tylo Vision is a stunning range of ultra-contemporary sauna cabins. These exceptionally well-designed, contemporary sauna cabins are crafted to appeal to those with a desire for light open space whilst enjoying the optimum atmosphere of these luxury saunas. The curved beech or alder structures are beautifully detailed and combine beech and smoked glass panelling to ensure both style and utility are dutifully attended to. As with all our cabin saunas we offer a complete service from initial enquiry, helping you choose the right sauna plus delivery and installation across the UK and internationally. Highly crafted pieces alder provide additional contrast on the sauna cabin interior fittings. Inside also boasts inset down-lighting with comfortable bench seating and backrest that sets off the overall ambiance of the sauna experience. The cabin door boasts alder framework & magnetic door catch. 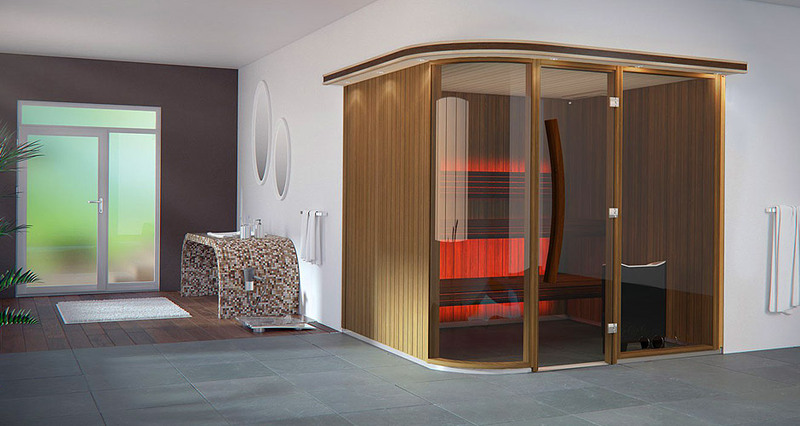 The Space Vision steam sauna cabinet has been purposely designed to provide you with as much light as possible and the added sensation of space. It has a distinctive and generous sweeping glass rounded corner which beautifully contrasts with the natural aspen wood panelling and framework. As with many saunas designed by Tylo the Round Vision was nurtured in the fertile crucible of contemporary soil and breaks new ground in the market of modern home saunas. Aside from re-setting industry design standards the Tylo Round Vision also encompasses the very latest in sauna technology to ensure its uncompromising utility. In keeping with the other models in the Tylo Vision Range, the beautiful steam sauna cabinet interior has inset down-lighting, aspen ceiling and walls and beautifully contrasting alder fittings. These are traditional not infrared sauna cabins. Steam is supplied via stunningly designed sauna heaters chosen from the Tylo heater range. If it was ever possible for a sauna cabin to feel simultaneously compact and spacious then this is the design that has achieved it. The beautiful Tylo Midi Vision is a practical, elegant and welcoming sauna experience. The cabin comes with corner access which is specifically designed for both commercial and home use. The robust use of curves in the sauna cabin design keeps it in synch with other models in the range with the usual inset down-lighting for ambience and aspen / alder contrasting interior. The curved glass entrance of this exceptional cabin sauna has the option of being fitted to either corner to increase the overall utility.